I bought The Circle by Dave Eggers when it came out in 2013, read about 25 pages of it, and set it aside. No reason, really – I was intrigued by the premise and, as a social media professional, it was definitely up my alley. Fast forward 4 years to when my daughter saw the preview for the movie this summer and got interested in it. I suggested she read the book first, so she did, and then I picked it back up and finished it. The Circle is about a fictional social media/search technology company called The Circle, which is basically an amalgamation of Facebook and Google. Mae Holland, who lives in the Bay Area with her parents and works in customer service at a utility company, gets an interview at The Circle, set up by a close friend from college named Annie, who is an executive there. Mae gets the job, and her orientation at The Circle takes the reader into the cult-like campus, where thousands of employees enjoy benefits like yoga, free medical care, meals, concerts, lectures, trampolines, dorm rooms – the list goes on. Mae is initially reluctant to embrace the full Circle culture, with its forced engagement and interactions, but before long she moves up the ranks in Customer Experience, is noticed and lauded by the company’s founders, and gets drawn into the company’s philosophy of sharing, connection and ubiquity. Mae’s parents and her ex-boyfriend provide the foils for Mae, who becomes increasingly blind to the perils of a private company owning data and access to pretty much all of our everyday lives. Her father has MS, and when the book opens he and his wife spend most of their time dealing with his illness and fighting with insurance companies about treatment coverage. Mae is able to get him on the Circle health plan in exchange for data about his condition, and her parents are unwillingly co-opted into sharing their lives via cameras placed in their homes. This goes badly, of course, souring them on the Circle and estranging them from their daughter despite their dependence on the medical care. The Circle is a relevant and timely warning about the intrusive dangers of technology (lack of privacy!) and our growing dependence on affirmation, streams of real-time information and “connection” (however superficial), mostly created by the social networks that have become intrinsic to so many of our lives. While The Circle dreams up some extreme scenarios (requiring everyone to have a Circle account to be able to vote; installing tiny cameras all over the world that can be accessed by anyone; pressuring politicians to go “completely transparent” through real-time monitoring), we’ve edged even closer in 2017 to what’s going on in this book than when it came out. I am not a social media critic – in fact, much of my career has been spent devoted to social media – but I can certainly appreciate its dark side. Eggers’ book is not a subtle one (at all), but it’s a meaningful one and I am glad I read it. This stuff can be scary, and given the political climate we’re in right now, the negative implications for the technology Eggers described are staggering. I suspect that most people who wanted to read The Circle have done so already. What did you think of it? My daughter and I are halfway through the movie, and I’ll report back with a book vs. movie post when we finish it. Posted on October 18, 2017 by gayle. 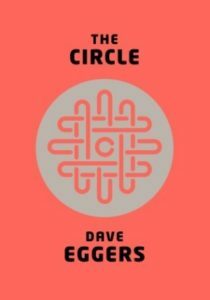 This entry was posted in Fiction and tagged Dave Eggers, The Circle. Bookmark the permalink. I loved it and think everyone should read it, especially those of us that work in tech. However, what’s the call to action or change at the end? It definitely was not subtle, but it also didn’t give much hope for change or for the future. Looking forward to seeing the movie, one day!